A formal portrait of the Jacob and Ida (Stauffer) Snider family. Front Row (left to right): Ida, Jacob, Eileen, Irma Snider. 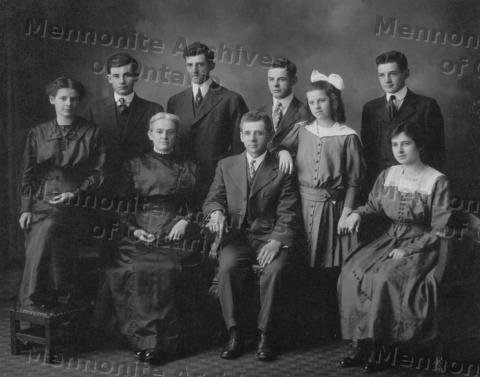 Back row (left to right): Beulah, Vernon, Howard Jr., Willard, Clare. Howard was married in 1919, so the photograph was taken before that, possibly about 1912. A biographical profile of Ida Snider can be found in Willing Service : stories of Ontario Mennonite Women / by Lorraine Roth.